The southern part of the Costa Brava consists of three towns - Blanes, Lloret de Mar and Tossa de Mar, all on the coast, with hills behind. Around Lloret in particular, the hills are full of large sprawling urbanisations of houses and villas built to target holidaymakers and second home owners. 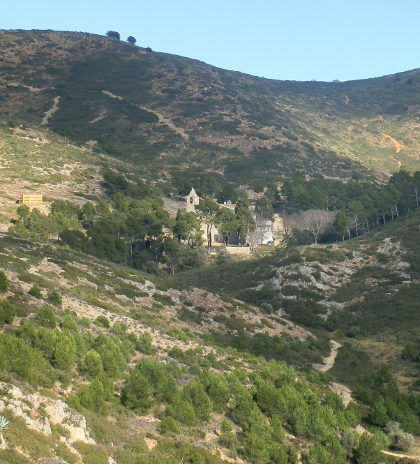 We have explored a little bit behind Tossa de Mar, but nothing into the hills behind Lloret, so seeing one of the spurs off the GR92 runs inland past something call "Angel" we thought we'd explore. 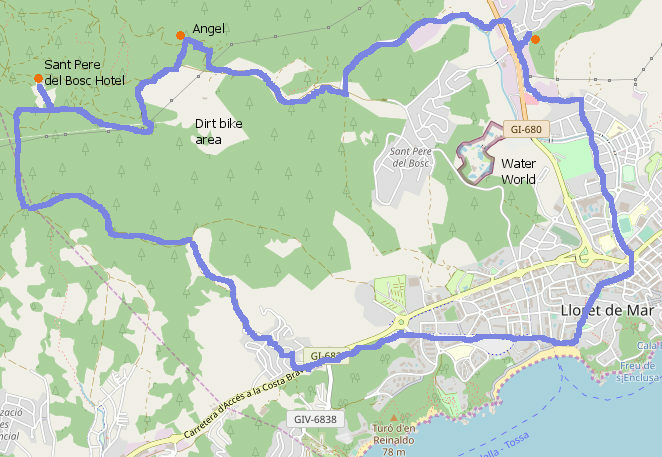 Our route starts just outside Lloret de Mar, just beyond Water World water park (which is open from the end of May to September), close to the Emita de les Alegries (or Aldi). The path is well marked with clear signposting, and the traditional red and white flashes that mark a GR. We park just into the Urbanisation of Mas Romeu, and walk up to the first sign post. We have to cross the road which, being a main access road to Lloret, is busy with cars heading in and out, even though this is still March. Crossing the road the path is easy to follow alongside a small stream and heads up towards the hills and it seems that Lloret disappears quite quickly from view. The path heads up past a very large water works, with very large settling tanks that are empty at the moment, waiting for the influx of summer. The faint smell of sewage isn't so nice, and it's not the best start to the walk. After the waterworks the track follows a tarmacked road up into the countryside, used by a handful of cars heading for a hidden restaurant. We reach our first junction, and turn to the right. The tarmac disappears, but we are still on a gravel road, dry and dusty because winter hasn't had much rain this year. The path follows the track and unexpectedly we pass dog walkers and joggers - unexpectedly because it feels relatively remote. We're also passed by a handful of cars and a van that kicks up a huge amount of dust into the air without any consideration for ourselves or a jogger overtaking us. As we go higher we see that the van is probably connected to a number of motocross riders as there is a dedicated track in the forest with several groups of motorbikers whining away on the hillside. However, for us, to our right we see the signpost for 'Angel' pointing into the woods. It looks like it follows a track down, so we try that, but don't find anything. 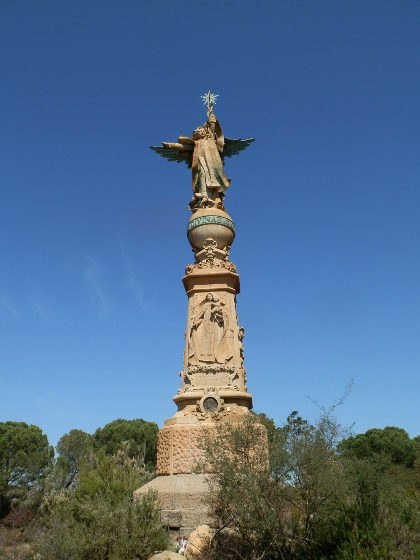 We retrace our steps and this time head upwards to find a tall finely carved monument with an angel on top of a column. The momument at some point must have been quite grand with steps and almost gardens around it, but now looks a little neglected. From the monument itself though, we can see a house and what looks like a church in the distance. 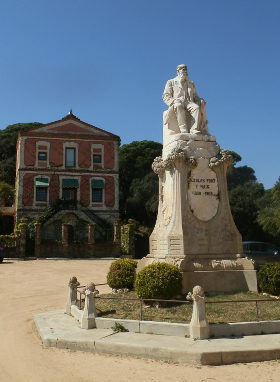 Though we don't know it, this is where we'll be heading - Sant Pere del Bosc, and the monument formed part of the large estate in the hills. From the monument we return down to the GR92 on the gravel roadway. 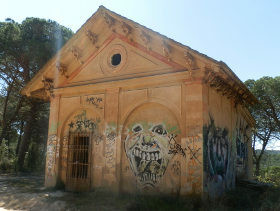 More motorbikers pass us and we walk past two modernista chalets/buildings, again in a poor state of repair and covered with graffiti, but indicating the grandeur of the estate at one point. The road splits and we take the left fork, still on the GR, and it runs around the hill over a 20m high brick bridge over a gorge, with a little bit of water in the stream creating a wooded glen. Now the track turns back up into the dry again, past flowering lavendar and rosemary, but feeling more arid. 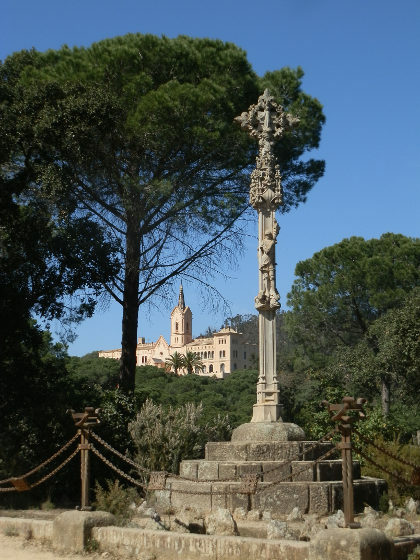 Towards the top we find an ornate stone cross and then the gateway to Sant Pere del Bosc - a hotel and spa now, but formerly a convent and then a count's mansion for Nicolau Font Comte de Jaruco (1830-1908). The path runs around the outside of the hotel, but we go into the grounds to take a peak. The main building retains its convent look with a large plainish front with arched windows, but a ceramic tiled church-like spire in the middle. This is now the main part of the hotel and looks over a crystal clear swimming pool in the garden. To the sides are two other buildings and a statue to the count who was the former owner. And in the grounds just outside is another small tower. With a morgan car on the driveway it feels like stepping back in time to the 1920s and 30s, with the woods, and sea and blocks of Lloret away in the distance. The panel outside the hotel explains the history. A convent in the 11th century, destroyed by the French in 1759 and rebuilt in its present form, and then sold off when religious buildings were sold, and bought by Nicola Font i Maig Comte de Jaruco, one of the Catalan Indianos who made his fortune in Cuba who then refurbished the location and estate, followed on by his descendents introducing modernista elements. We return to the GR past the hotel and back into the woods. At the top of the hill we aim to turn left and to take a mountain bike route (BR4) back to town and we have to check the map to find the right route. 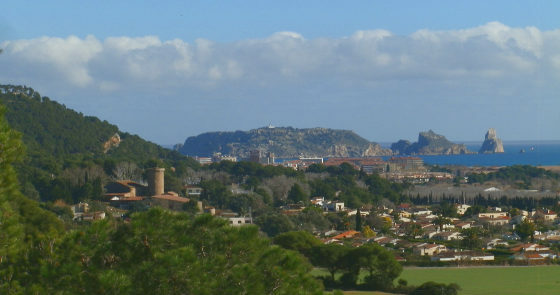 The top of the hill gives views over the valley and town of Tordera, and to the right of Lloret town, we can see Blanes and the tower of Sant Joan up on the hilltop above the sea. The walk back down the bike route is more pleasant than the road way up as it's narrower and without cars with a gentle slope down past some woodland barracas. 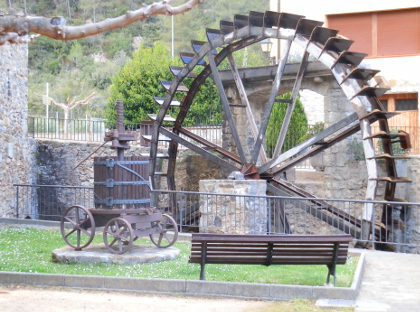 We reach a well-kept vineyard, which feels a little out of place in the woods but is very pretty, and turn down towards Lloret and Santa Cristina. where it runs into a housing estate and down to the main road. The road is busy, and it's not clear if there's a footpath into town, but crossing over we find a track that was hidden by the height of the road and return into Fenals and through the heart of Lloret. Lloret itself is trying to divest itself of a reputation as a drunken boorish party town and the modern apartments around Fenals look attractive. It's towards the centre of town that you see the banks of hotels, with terraces like pigeonholes over looking their pools. The centre of town itself is where young people hang out in the season, with a large fairground catapult tower and bars and discos. During the day as we pass, there is nothing going on, but lots of Russian voices and older Catalan visitors in town. We head up towards the modern sports area and schools that look as if they have had a lot of money invested with several sports halls, and an indoor olympic sized swimming pool. The area is more residential and park like with places to stroll besides the apartment blocks. Heading out it feels more local and less touristy. A small neighbourhood festival is happening in one of the parks. As we get closer to the car, we're passed by families in traditional Sikh robes and turbans and we pass the Sikh temple where it looks as if there has just been a wedding with large numbers of ladies in ornate and brightly coloured saris. Finally we reach the car feeling a little dry and red from the March sun and the relatively long walk. 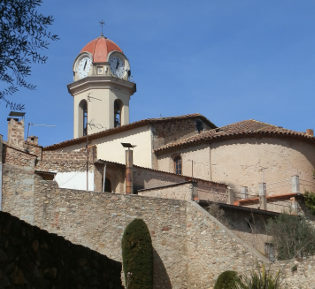 Sant Llorenç de la Muga is a small town situated in on the Muga river in the hills that rise behind Figueres to the French border and is a real find. The town with its old bridge, well-preserved centre and town gates complete with portcullis entrances is complemented with a tower, castle and walks into the pine woods along the river. It's difficult to explain, but as you leave Figueres and pass through Llers into pre-Pyrenees the landscape seems to change dramatically within just a few kilometres. From the broad Empordan plain that stretches to the sea, suddenly you are in deep wooded valleys with high peaked hills and behind them views of the snows on Canigou. The trees are pine, instead of the lower Alzina and cork oaks nearer the coast, and the fields along the bottom of the valley are cultivated with crops rather than the olive groves of the drier fields of the Albere mountains that you would find closer to La Jonquera. 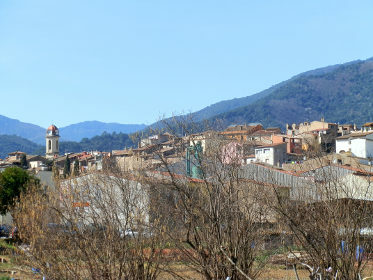 The town of Sant Llorenç de la Muga is found on a single in-and-out road that leads to Albanya and the Gorges de la Muga (which we intend to get to in summer). 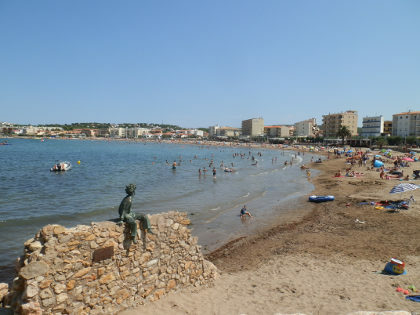 However, despite its relative remoteness the town is very well renovated and preserved, attracting French tourists from across the nearby border. 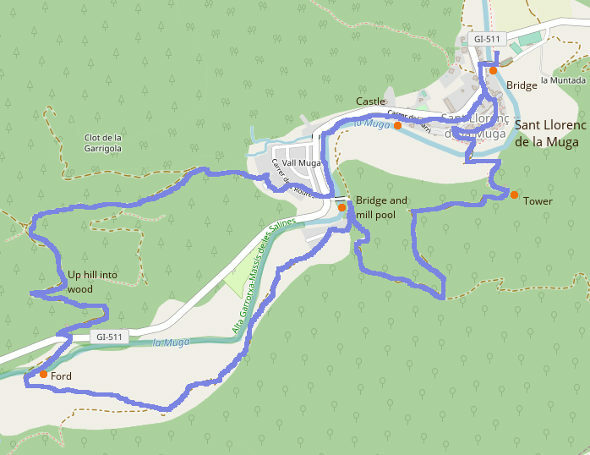 For this walk we arrive and park in the first parking area, just before the new road bridge, and right next to the old original stone bridge that crosses the Muga. In the vicinity of the parking, down towards the river is a odd house clad in reeds or wood almost like thatch - something we've never seen in Catalonia - and it's not clear if it is a house or a working building as there are scattered remains of charcoal in a circle outside. After taking photos of the old bridge from the new bridge, we cross the old bridge into town. The bridge is a classic cobblestone bridge with clear shallow Muga river bubbling over the rocks and stones below and we can already see the church and the watchtower that stands above the town. We head towards the town centre to explore a little. 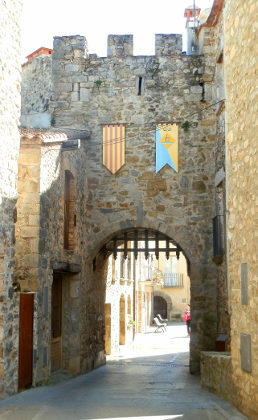 The first thing we come to is a town gate with portcullis in place, just beside the safareig (communal village laundery or wash place - very common in Catalonia towns) beside a smooth running stream. 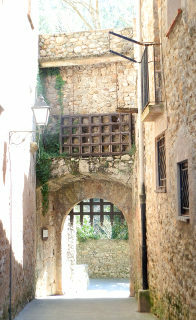 The portal gate leads into the main part of town, two small plaças and stone walled medieval houses that look as if they could have been built yesterday. 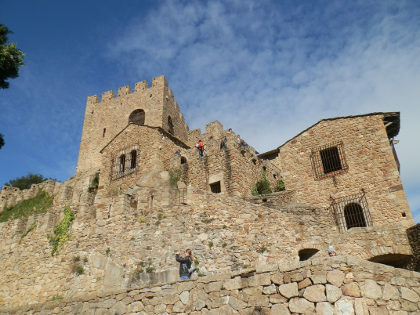 Our tour of the centre discovers more gates, all with portcullis in place, and a large square in front of the ajuntament with French speaking visitors taking lunch on the terrace of one of the local restaurants. Leaving one of the town gates we find a strange triangular bridge over the river that seems to lead up to the watchtower above the town. Keeping it in mind, we return via the next gate to see the church - almost two churches actually - one older in front of the newer clock tower. We now follow the river, crossing it on an older bridge just below the triangular bridge so our dog doesn't have to cross the metal gridded floor which is uncomfortable for her paws. On the other side of the river there are a series of flagstone steps and pathway that climbs up to the tower. From the top we have a grand vista of the town and the river valley below, and out to the higher hill peaks in the distance. From the tower, we take the track at the back down, rather than the way we came. This gently follows the rough direction of the river past a telephone mast, and then down through the pine woods and white blossomed shrubs and budding deciduous trees enjoying the spring sun. 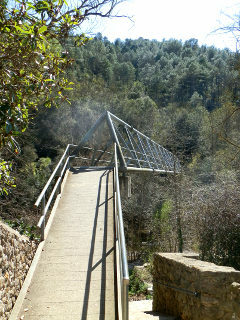 At the bottom we pass a masia farm then arrive back at the river, just by a second old stone bridge. 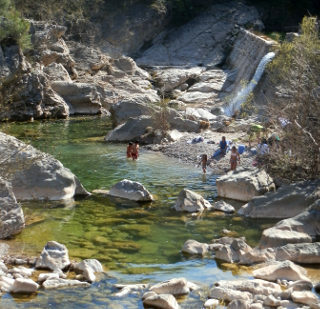 This time we can here music and rushing water and we can see a family swimming and picnicking in a water pool beside a waterfall close to the Ermitage de Sant Antoni. Its March, so it's surprising to see people swimming, but the water looks lovely - deep and clear, particularly under the bridge itself. Instead of returning towards town, we carry on out taking the path past the small number of houses and out back into the woods above the river valley. After about 3km we take the path down towards the river, past another farmhouse and find ourselves with a ford and long-step stepping stones to cross the river. To make the loop back, we want to avoid the road - which is quiet, but we prefer to be off the tarmac, so we head up a track into the hill, climbing steadily at quite a puff. The first junction right takes us down on the far side of the hill and we follow the path steadily back down to an urbanisation close to Sant Antoni bridge. As we go down we pass more French tourists on a walk themselves. To connect back to town there is a path just beneath the road, which you find if you cross the road close to the Ermitage. Though it's close to the road it is quite separate and there is no road noise, and good views of the river. Eventually this path arrives at a metal gridded path/platform that runs above a millstream water channel for about 200m - the water clear with fish and water boatmen underneath the metal grid. It would be lovely, except for carrying our dog (who seems a little heavier than we remember). Eventually we reach steps at the bottom of an old castle - privately owned, so not visitable, but right next door is a working waterwheel powered by the mill stream we just walked above and along. From here we connect back into town meandering back to the car park. A lovely walk and town that surprised us, but has already got us thinking about going back to explore further up the valley. 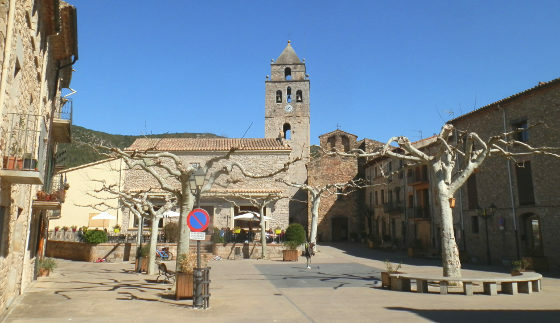 Anglès is the main town that you'll reach if you head almost due west from Girona out along the river Ter. 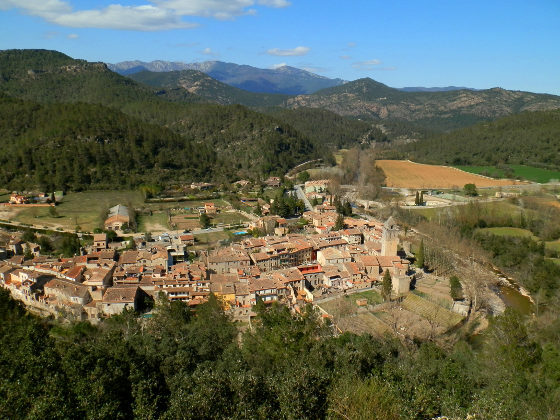 The town is situated on a small hill above the river plain but surrounded by hills, the main ones being the Guilleries Massif that acts as the divider between the plain of Vic and that of Girona. 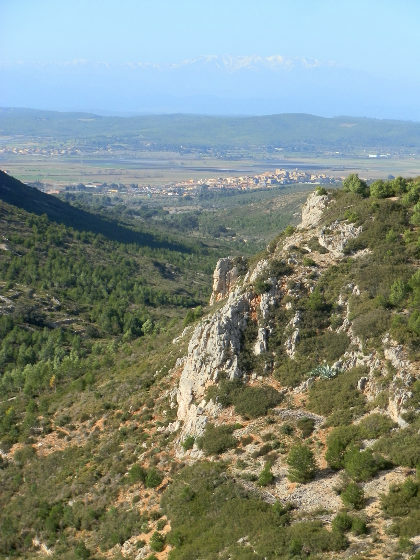 (and it's through this range of hills where you'll find a series of spectacular river lakes (the Panta de Susqueda and Panta de Sau) formed from damming the river Ter as it passes through the hills starting at the neighbouring town of La Cellera de Ter). 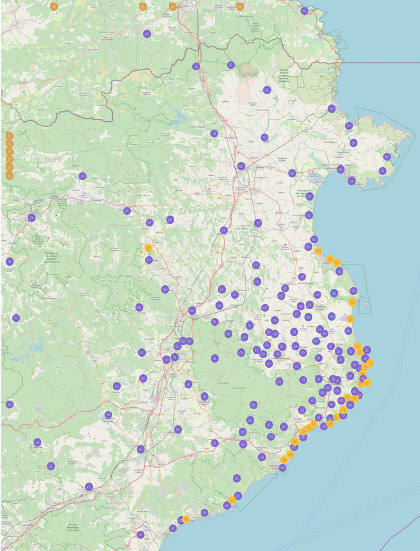 When we were updating our map of walks, we realised that we haven't really covered this area west of Girona. We have visited and explored, but not actually written anything up, partly because we're not too familiar with the area. The geography is one of long river valleys - the river Ter, the river Llemena, below large sparsely populated hills and more isolated villages, some with high escarpments, making for more linear type walks. So to try to provide more of a feel of what can be found in this area, we're doing a relatively flat exploratory walk starting in the new town of Bonmati (built in 1990), along the Ter and the Via Verde of the Carrilet that runs along the old railway line from Girona to Olot, and then back via Sant Julia del Llor. 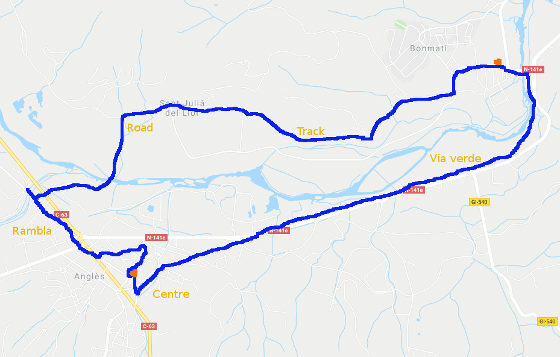 We'd not visited Bonmati before - it's just beyond Bescano along the river, and the road, river and old railway route run close together in parallel. 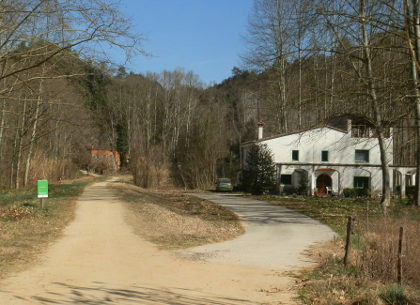 The Via Verde is used as a cycling path and is popular with cyclists who share the gravel track with walkers, some of whom are following the Catalan part of the Route of Saint James as it heads to Santiago de Compestella. Bonmati isn't much to write home about, a few factories and warehouses and the bulk of the town consisting of new urbanisation housing and a large and very impressive sports centre. However, it's easy to park and connects directly to the Via Verde. We're currently just pre-Spring and the buds are appearing on the trees, but no leaves at the moment. 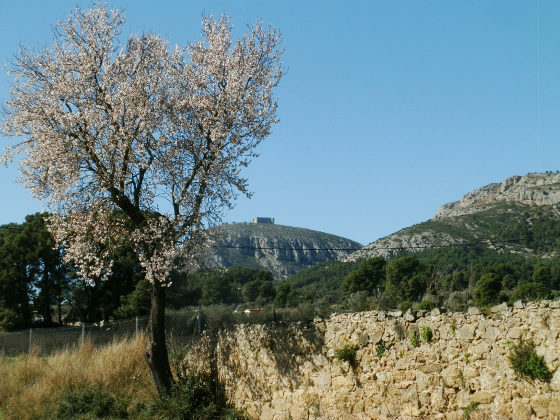 However, the day is warm and its pleasant to walk in a light jacket, with the blossom appearing on the almond trees. The walk could be considered more of a stroll as the path is broad and flat with views to the river, which perhaps isn't at its most photogenic time of the year. Because the route is shared with bikes, we keep an eye out for families and other cyclists from both directions. Fortunately they're not fast - the quicker road cyclists can be seen on the road that runs beside the path. In fact, we're close to the road for a lot of the time as we head to Anglès in the distance, and cars do use it as a main route, to there's a fair amount of noise. Everywhere around here seems to be allotments or vegetable gardens (horta), with soil carefully weeded and prepared and signs of onions, cabbages and cauliflowers, and bamboo frames for beans and peas. As we get close to Anglès we pass one of the old masia farm buildings (Can Biel) with a large square tower that looks unchanged from the 18th century - rough but sturdy, still farming the surrounding land. 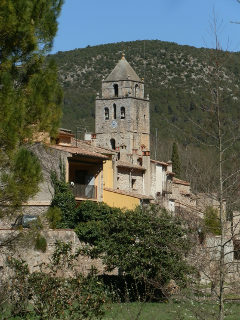 As we get to the outskirts of Anglès we cross the main road (which diverts around the outside), to take a town road towards the centre, the church tower with its four clocks on the rise acting as our target point. Anglès is a slightly strange mixture of modern, old and, it has to be said, the occasional derelict building. We've visited two or three times in the past, and it's fair to say that efforts are being made to upgrade the town - there is a sense of regeneration. 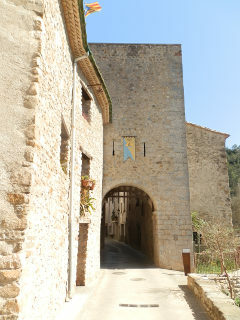 However, Angles like some other communities into the hinterlands west of Girona carry a sense of mixed fortunes. The older buildings and churches are interspersed with crudely built blocks of flats built in the 60s and 70s, and as the towns fortunes waned, some of the older buildings have fallen into disrepair. In more modern times, the money has gone into new buildings in current design, and it feels like it is only recently that older buildings are seeing restoration of their fortunes. The result is a curious mish mash of styles where a brand new luxury apartment building might stand next what could be a decaying, but potentially very pretty, 1900s modernista building. Along our route into town we cross a small stream, clearly recently cleaned up, waiting for rain to refill the cleared river bottom of displaced soil. The river itself trickling through, leaving large trout trapped in deeper pools. And then we double back to the park of Can Cendra, before taking the road up the hill into the older part of the town to the church at the top with views across the town and out to the hills. The upper part of Angles is relatively small - the church connects along the old Carrer Major to the main town placa, unfortunately too full of parked cars to be very attractive. Along the Carrer Major, the older buildings have been marked and labelled giving a flavour of the history, but still with the odd mix of well and badly preserved buildings. We navigate down to river level around the back of the placa, and then through the recently updated streets under the church - part of the restoration since last time we visited. We then head out back towards the river and the large old Bures factory and past the old station. 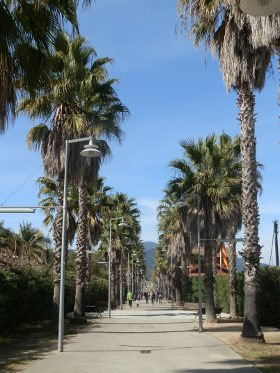 The old train line has been converted into a strolling route, almost a rambla, with tall palm trees marking the route as it passes the old station - the palms being a little incongruous this far inland with the greenery of the surrounding countryside. To the left of the station as we're walking we see a large modernista house (Villa Eulalia). It's slightly hidden from view by large trees so we loop back across a makeshift football field and this takes us to the Barri of Cuc - a small group of older houses close to Can Cuc, a beautifully preserved old masia with lovely exterior stonework. We still want to see more of Villa Eulalia, but it's tucked behind a large gate. However, we can see that it is another one of the older grand buildings now in a poor state of repair with missing glass and out of control vines growing up the wall. Leaving Anglès we continue a little way along the carrilet again considering whether to head to La Cellera to add the entrance to the Ter river lakes to the walk. 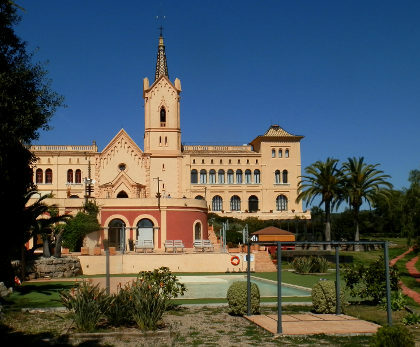 However, instead we cross the road and out to Sant Julia de Llor. 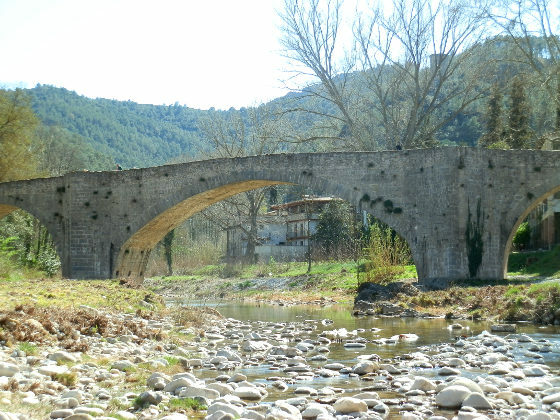 The walk crosses the river along the road before turning to the right to Sant Julia, just past the remains of a ancient Roman wall or house. If we'd turned left we'd have reached a Roman bridge, but didn't realise this at the time. Sant Julia de Llor stands slightly about the fields of the flood plain looking towards Anglès - a simple one road linear village. On the far side we finally return to a track and edge along the bottom of the hill back to Bonmati. It would be possible to go up to the top, but the air is still and the day is getting hot in the shelter of the hillside. Montgri is probably the most iconic mountain of Emporda rising above the surrounding plains visible for miles in any direction, characterised as a reclining lady with its isolated castle acting as a beacon and signpost for visitors and migrating birds. We have touched on Montgri in several walks in the past, but not really done justice to the mountain itself. 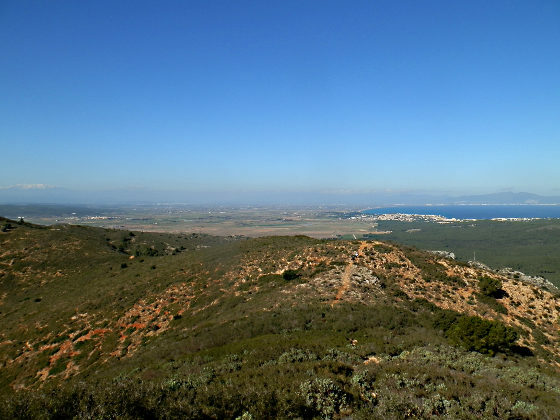 For this walk we're following a route from Urbanisation Les Dunes, situated between Torroella de Montgri and L'Estartit, up to the top and along, then back down to Torroella to complete the loop along the flat. 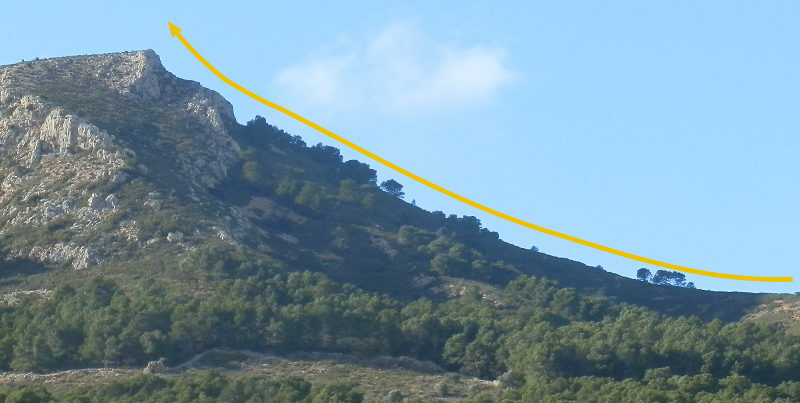 Though Montgri looks benign from below, in practice this is a challenging walk, particularly if you don't like heights or steep climbs. And unfortunately that includes me, so this is a walk that has parts I don't like - it's actually the second attempt to complete it, and even then, we didn't do the whole walk as I'll explain. 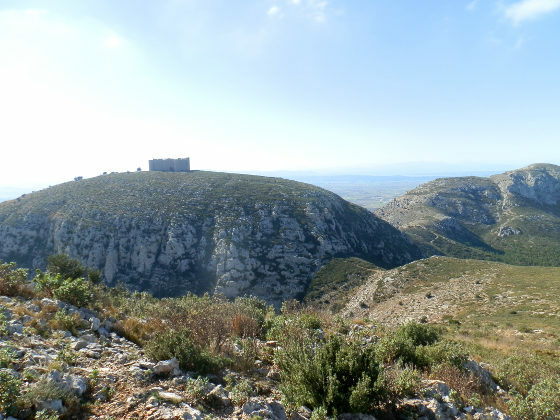 Montgri rises to 311m, so it's not that high as mountains go, and is a dry, relatively barren and rocky with vegetation limited to low holly and rosemary with plenty of loose stones and rocks underfoot. Even if just going up to the castle from Torroella, Montgri is a mountain that requires proper footwear. The walk starts gently, Les Dunes urbanisation up to the house of Les Dunes midway up is a walk on soft sandy paths through the cedar pine woods with views out to the Illes Medes and L'Estartit, and across the rice paddies around the Ter river. At the house at Les Dunes, is a small picnic area and some parking, and views across to Cap de Begur. For walkers the Col de Sorres links paths to L'Escala and Sobrestany over the hills, with the main east-west path up to the mountain. We take the path up, and soon we have left the trees behind us, and are fully on the hill, with the ground changing from softer soil to thumb and fist sized rocks lying loose on the ground, that slip and crunch as you walk on them. The path steepens as it goes up - one of the features of the paths from this side is that they are steeper closer to the top. If you have a sensitivity to heights this generally means the walk will get worse for you the higher up you go. The low scrub means that anywhere you stand you can see clearly in all directions with nothing to obstruct the view. The views initially are best to the left and behind to L'Estartit, but quickly you get to see the view over the Bay of Roses with a grand vista that takes in Cap de Creus and out to Figueres and the Albera mountains, and then on to Canigou currently topped with snow. The path continues to go up. Ahead you will see a small white cabin - this is roughly the direction we'll take. The cabin is just above an escarpment, but our path will pass underneath and then come up from the other side. However, before then we have to keep going up. The higher we are, the more it seems the sides of the hill fall away, and we catch the wind blowing across the mountain. Nothing is dangerous or difficult about the climb, but the height and steepness are uncomfortable for someone who doesn't like steep heights. Eventually the path reaches a point under the escarpment and levels out tracking under the rocks above. The hillside falls away to the right but no sharp verticals, though clearly you feel high up. Across the mountain you can see remains of a strange small stone hut, and out in the distance see the watch tower at Montgo. After passing along the flat path, we come to a T junction. 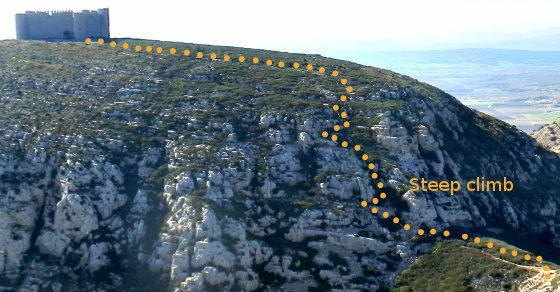 The left hand path goes up into the escarpment and onto the top of the long flat peak of Montgri if you were looking from the bottom (Montpla). The right goes down and eventually reaches the church of Santa Caterina lower down, situated within the folds of the massif. If you are walking and finding it uncomfortable because of the height, this is the first opportunity to find a different route down. There are very few connecting paths, so once you are on a route, the only other alternative would be to go back. The first time we did this I took this lower path, while the others I was with continued over the top. This time we head up through the last of the rocks, coming out on a large rounded top for the mountain, with views in all directions but the same scrub and low vegetation, so not really a comfortable place for a picnic or to sit and take a breath. Instead, we carry on along the top and then track down, past a small Catalan flag. We can clearly see the castle ahead of us on the neighbouring peak, and the path to get there. And we can see that this is not going to be a path I'll take. We follow the track down to the saddle point between the two peaks and ahead of us we can see another couple making the route up to the castle. From where we look the path goes up through the rocks and is steep with a drop. Fortunately there is an alternative, to the right is a steepish path in loose scree that will take us down into the valley at the bottom. There are no other options. Ahead is a family with children who also look as if they decided the climb to the castle was not for them. This is not a good path - the loose rocks slip and roll under foot, however, the only other alternative would be to go back over the first peak and down. After a rough scramble down, we get to the bottom and the main path to Santa Caterina church. The church is also the site of a restaurant and attracts visitors in the summer. 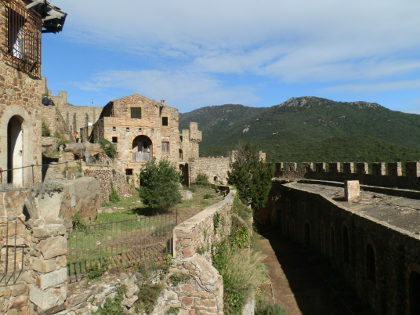 We head to the left, and to the saddle point with the cross that sits under the castle on the main route up from Torroella town to the castle at the top. From here, we then track back down to Torroella - the path remaining rocky and rough under foot, until you almost get down as far as the olive groves at the bottom. We turn past Sant Gabriel school on the road, past the football ground and out along the flat path past more olive groves and eventually past fields back to Les Dunes. 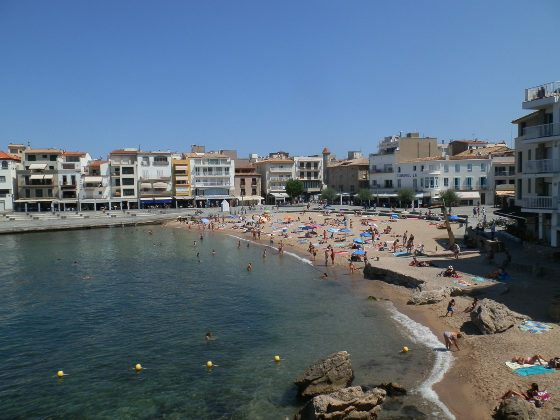 When we started this blog in November 2012 we added a lot of walks and visits around the Costa Brava pretty quickly. Now, with nearly 200 walks and articles under our belt, we've slowed down considerably in terms of adding content. It's not that we've stopped walking. We're still out and about following many of paths, or visiting many of the places we've mentioned (and adding updates to articles when we discover a change), but there are fewer new paths to add, and we don't include walks which we don't find too interesting. Having said that, it's 2019, so we're going to spend a little bit of this year doing some housekeeping to freshen up the site. And along the way we might adjust focus to look in more depth at some of the towns and villages and hidden nooks and crannies. 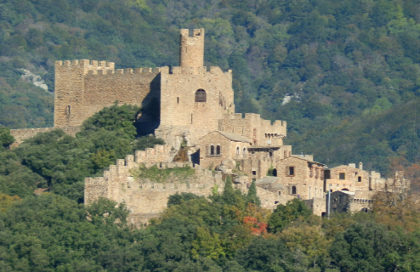 The Castell de Requesens is an oddly remote, yet wonderful semi-preserved castle set in the hills of the Albera mountains that separate Spain and France just to the east of La Jonquera. 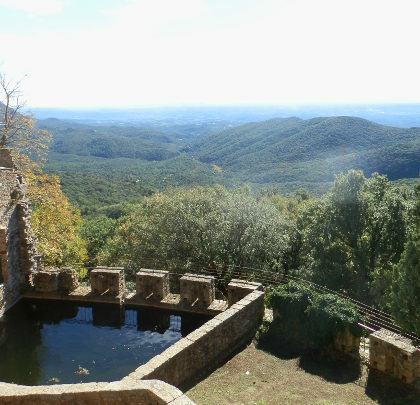 When I say 'oddly remote' it's because the castle itself is approximately 6km from the nearest village of Cantallops, along a dusty gravel track that wends its way through the hills and with no obvious routes or lands that such a strong castle would need to defend. We had seen pictures and we knew of the castle because it had cropped up in some deep history of the Catalan counties, and their warring counts, so on a clear day we headed towards the French border and La Jonquera, before turning out of the large cut-price supermarkets that cater to the departing French, and up to the small village of Cantallops. 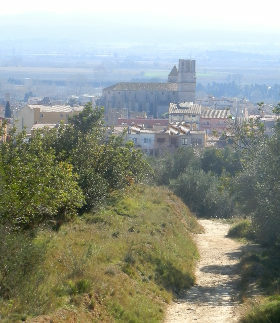 Our aim had been to walk from Cantallops up as there should be a circular walk to the castle and then back down. However, though Baix Emporda was clear as a bell, as our drive crossed into Alt Emporda the wind was blowing fiercely from the direction of the newly snowcovered Pyrenees. By the time we got to Cantallops there was a fierce crosswind channelling along the hills. Not wanting to waste the journey we decided to attempt to drive up, at least to see what the castle was like. What we hadn't quite anticipated was the gravel track we'd need to take just after the exit of the village. I'm not keen on untarmacked roads, particularly after having got stuck on Montgri a few years ago, and this was a typical one of those roads, pitted and potholed, narrowing at times and occasionally with an open drop to the side. We didn't know it when we started, but it actually gets better further up. Our suspension got a work out as we made our way up, but we weren't the only ones on the route. This is a popular place to visit as we found when we got to the top. The other part was that luckily we didn't meet anyone going up as we were early enough so all the traffic was in one direction. This is a one way in and out road, so later in the day you would find vehicles coming from the other direction too. The road climbs for a 3-4 kilometres and then reaches a gate. The gate marks the start of the Requesens estate - a large area of hilly woodland. Just outside the gate a number of cars had parked up in the limited space available, but as we discovered, it was fine to go through the gate and to drive all the way to the top for either the castle or for the restaurant set just outside the castle. We weren't sure if you really were permitted to drive on past the gate, and having the original plan of walking, it didn't seem too much of a hardship to walk the remaining couple of kilometres, so we parked up and walked, particularly since we were in the lee of the hills and so protected from the wind that we had seen further down. Our walk followed the gravel track, and we were passed by a regular drip of cars bumping along the track. After the first corner we suddenly got the first glimpse of the castle standing on a hill surrounded by the hills. From a distance it looks like a very well-preserved large chateau-fort to use a French description of a traditional fortified castle, rather than one that is merely pretty. As the track gets closer, there are signs of other buildings and a little bit more habitation - a monastery or convent in the mountain behind the castle, and old sawmills, and small fields nestle along a small stream at the bottom of the castle, with 10-20 of cars parked either for the castle or for the restaurant. All of which is quite a surprise for the apparent remoteness of the location. The stream itself was another surprise - with water rushing down and a few small cascades through the rocks. For the height (the castle is at about 500m) and the comparative dryness of the area we wouldn't have expected to have such as strong water flow. The track crosses the stream and then heads up to the castle itself. As we approached the main entrance we had to pass a herd of cows scavaging what grass they could in amongst the woods - another oddity. 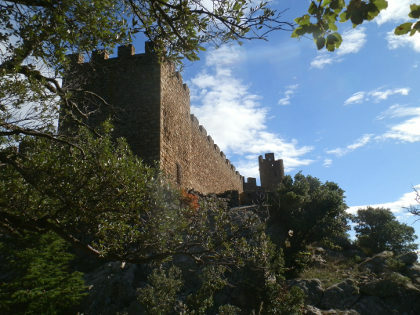 The castle itself has large outer walls in good repair. 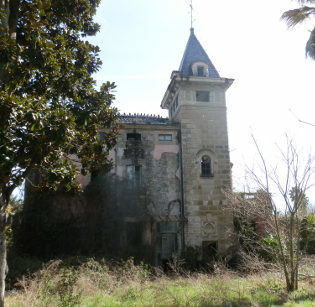 It was renovated or rebuilt at the end of the 19th century as a summer residence for the Counts of Peralada (the Rocaberti) before being converted into military barracks mid 20th Century. Though it is empty now and shows signs of deriliction, it is by no means a ruin. From the gatehouse at the bottom the first impression is something of a wedding cake of buildings layered on top of each other. Each layer is linked with stairs and walk ways up to the upper tower at the top (the tower itself isn't accessible). 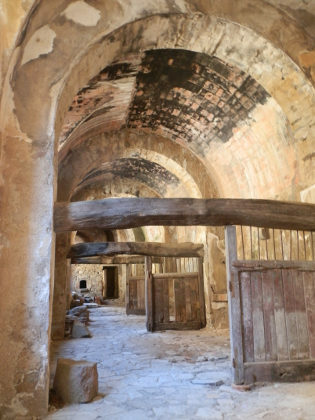 Much of the castle rooms are open and can be explored with the remains of kitchens and storerooms as well as living quarters with enormous views out across the Empordan plain towards the sea and the Mountains of Montgri to the south. And there's another surprise as water seems to flow down and through the castle - as if it's been built on an active spring, with water flowing down small channels on the walls and into holding ponds built beside the castle walls. 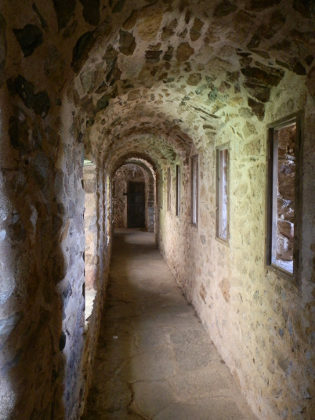 The cost to enter the castle is €4 per person, but it has the impression of an Enid Blyton type of castle of adventure, full of nooks and crannies and strange passageways linking rooms and courtyards in among the buildings. The rooms themselves feel a little abandoned and times, and there are signs of the time of military occupation with a hospital's red cross above one door. However some of the interior parts are clearly still being renovated and the castle has a certain joie-de-vivre. And we weren't the only visitors, with several families and younger children coming to explore, or taking the day out for the castle and Saturday lunch. The walk back was a little bit one way, though we did follow the stream a little more rather than the road through the narrow meadows by the ruins of the sawmill. And we were passed by cars going down from this strangely remote yet well-visited castle. 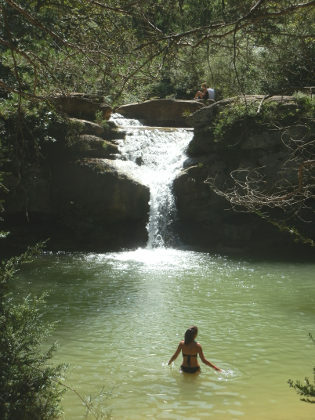 In Catalan the word Gorg refers to a river pool, and these river pools are often found in rivers in the mountains at the base of waterwalls, or where rivers run through gorges. 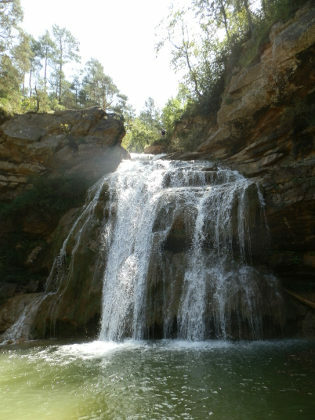 Els Set Gorgs is a series of seven pools (Set = 7) with waterfalls on the Torrent de la Cabana or Torrent d'Estiula in the hills above Campdevanol, a town close to Ripoll (there are only five pictured here). Over the last few years we've started to take a day out to the mountains to find some hikes possibly with some rivers and mountain pools where the walk can be combined with a little bit of swimming away from the tourists on the coast - such as Sadernes. 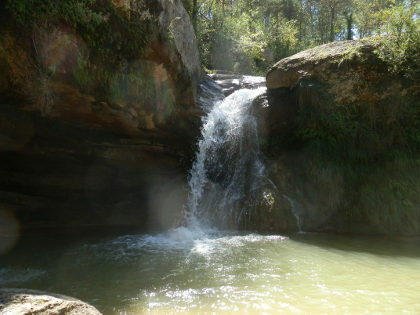 The 7 Gorgs themselves are well known in Catalan, but perhaps not so easily discovered in English (where they are sometimes called the route of the seven waterfalls), and are sufficiently popular that during the summer the local council charges €5 'ecotax' per person to access the valley, and limits the number of visitors to a maximum of 500. (If you're looking at reviews online, many of the low ratings are complaints about the fee to enter, rather than the place itself). The thought of an entry fee did put us off at one point, as we felt it could be over commercialsed. However, in practice the valley really is natural, and like the charge to walk the Cinque Terre route in Italy, it is clearly a charge designed to protect a very beautiful area from being spoilt by too many people. The drive to Campdevanol and Ripoll took slightly under 2 hours drive from the coast - about 120km (75 miles). We don't have much in the way of maps for the area and though we found Campdevanol, we didn't quite find the right turning for the road. So instead we just parked in the town and walked finding directions at the station (which added a pleasant 3.5km to the walk along a stream). As Campdevanol does have a station, it would be possible to catch the train up from Barcelona, then walk out to the gorgs. If you're driving and find the way, there is car parking at the bottom of the gorg valley that you pay for (some say €10, some €3). However, the walk out from Campdevanol was very clearly marked and followed a stream with crystal clear water up a broad valley into the hills. The path tracked the road, but apart from a short stretch walking was by the river or in the trees. At Font de Querol we passed a large barbeque area by the river which was just starting to fill up (and was full when we came back). 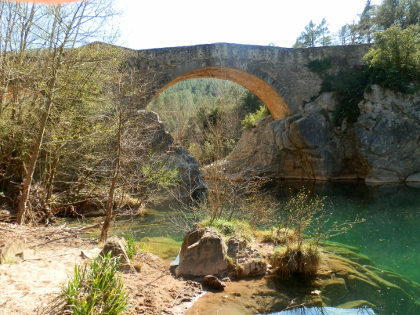 After the Font de Querol, there's about another kilometre to reach the valley of the gorgs itself. Finally, we pass by an adventure park and their very long and high zip wire across the valley, before getting up to the ticket booth and entrance. The number of picnickers was an indication that the area is popular, and because this was the last weekend of August, and we knew there was an entrance limit of 500, we were a little concerned as to whether the park would be too busy to get in. But it wasn't a problem, though the week had had some thunderstorms which had cooled the air a little which might have reduced the number of people wanting to visit. As I said, we weren't so sure whether to go in, but having made the effort to get there, we decided to try it out - the answer is yes, it's definitely worth it. The gorgs stretch out over about 3-4km, so although I doubt we had 500 people in the park when we visited, the people spread out over a larger area. Although some of the smaller gorgs get a little crowded. (Note that you can take dogs, but they need to be on a lead and others will have dogs in and around the pools). Inside the park, the gorgs are clearly indicated and it was just a case of following the signs. However, the paths do cross the streams and there were large patches of mud in places, most probably from wet shoes from people who had been in the water. You can get around with dry shoes, but it's much easier with water shoes, or shoes you don't mind being wet in - though you might need a dry set too for walking back. Secondly, though the path is marked and well used, it is a narrow track in places, and in some situations, quite a scramble. We saw plenty of younger children, but you also need shoes you can walk in comfortably - flipflops don't make sense here. The first gorg, at the bottom, is the most difficult to get to. The path descends through the trees to the waterfall at the bottom, and it's relatively steep and, because of the wet feet coming back up, has a quite slippy mud surface. To help get up and down there are ropes strung up, and you definitely need them. Our second problem was that we entered at about the same time as 3-4 other small groups, which did mean that we were all on the path to the first gorg at the same time. This is a good reason for the people limit. Though the scramble down was slightly challenging, the waterfall and gorg at the bottom was beautiful. Immediately all doubts about coming in to the park disappeared. 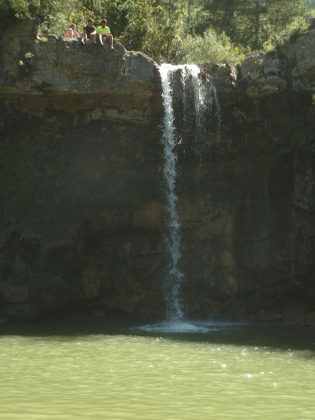 The pool is relatively small - the size of a large swimming pool, with a cascade of water. Around the edge was a little crowded and there was a stream that you could cross via rocks, or just wade through the water - it's a lot easier stepping into the stream. Naturally we wanted to get in and try the water. So we did get in but lets say the water was 'refreshing'. Despite being the last week of August the water is very cool. We actually swam in all the gorgs, but for each it was a quick plunge in to cool down and out again. Lovely to swim under the waterfalls, but not for very long. Other visitors were also pretty much quickly in and out too. From the first gorg, after a scramble back to the main path, we carried on up the trail to each of the next gorgs. They are all different, all very natural, some larger and some smaller than then first one. Being natural there are stones and rocks at the bottom of the pools, and the depths can be uneven. 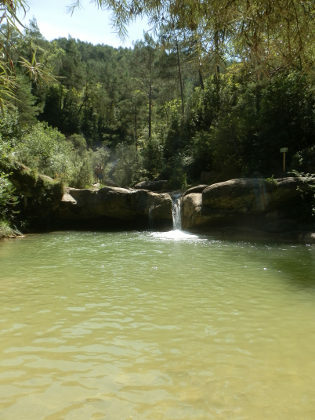 The largest pools were towards the top and invited swimming if you could manage with the temperature. The smaller pools at the bottom weren't quite so deep, so though it was possible to jump from rocks into the water unless you've checked the depth beforehand, it's not advised. We did see some people jumping in Gorg 3. Generally the path goes up, but you have to divert to reach the gorgs themselves, often along a small side track. We missed Gorg 5 at one point and doubled back along the river close to the water, but there isn't really any way of just tracking the river itself along the stream bed, so best to stick to the paths. Each of the gorgs has a waterfall. The smallest were Gorg 3 and 5. At Gorg 1, the cascade is pretty broad and dramatic, while some of the higher Gorgs had longer but more narrow waterfalls. Each pool therefore had its own character. The path continues up for about 3km following the stream and though you could walk it quickly, in practice while you're getting to the gorgs themselves, enjoying the water and taking photos, it can easily take 2-3 hours to work all the way to the top. Since it is a reasonable walk, quite hot in the sun, it is necessary to have water and sunscreen with you. At the top just above the last waterfall is a small makeshift bar area with a meadow to relax. Then there is a broad gravel mountain track that takes you back down to the start point that runs along the hillside above the valley - about 30-40 minutes back to the bottom. The largest freshwater lake in Catalonia is at Banyoles, just north of Girona. We've visited in the past for the walk around the lake, but not actually been to to the lake for swimming. This was a chance to try the water. 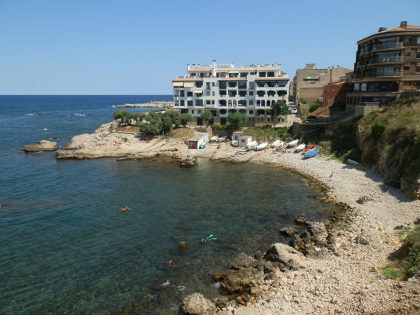 Swimming in the lake is only allowed in summer months in certain areas - two are paid for lido type closer to the town - at the bar of Banys Vells, or the Club Natacio. The third area is open to the public, at Caseta de Fuster towards the north of the lake past the sport complex, which is where we visited. Outside of swimming, the lake itself is mostly used for rowing. There is however, also a 'cruise' boat that does circuits of the lake for tourists and I believe there is also an annual open water swim organised on the lake for more competitive swimmers. 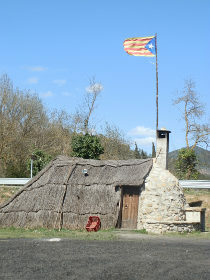 Caseta de Fuster is found just to the north of the sports complex/ prehistoric village. The sports area includes the sports hall itself, areas for walking, picnicking and flat flood meadows that are dry in summer. Lots of families had come for picnics when we visited enjoying the ambience and being close to fresh water. There were also a good mix of Catalan and non-Catalans enjoying the summer sun, with the surprise of seeing a rough game of cricket being played by some Indian families on one of the flat fields (you can find cricket in the unlikeliest of places in Catalonia - almost always played by Indian or Pakistani community - we saw it an empty supermarket car park in Badalona at one time). 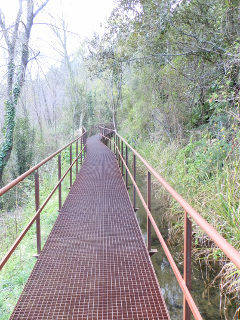 There's a short stroll needed along the path to get to Caseta de Fuster along the path. It's difficult to miss because there were plenty of people with towels and inflatables going the same way. The area itself consists of a relatively small green grass meadow/lido area, and then the swimming area marked out into the lake by a string of yellow floats. It's not a very large swimming area and the green was also pretty crowded with people and towels on the grass. 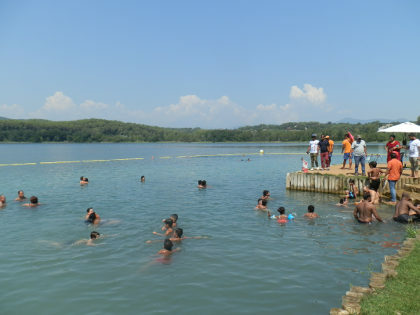 For swimming, you would be able to swim lengths, but the yellow buoys don't extend very far into the lake itself with a result that the waterside area could feel a little cramped compared to say the sea, and the whole area is monitored by two lifeguards. The water itself was fresh and relatively clear. We were able to see the lake bottom about 2-3 metres down, and it was relatively deep . However, there was little in the way of 'beach' and the water was deep quickly, stepping off rocks from the edge straight up to the middle. And in the area to the right, the water was deep enough close to the edge, that people were jumping from the side into the water. We didn't swim too much - a length or two up and down along by the floats. It was more for splashing about than just swimming - and a little crowded closer to the water's edge itself. For a change from the sea at the Costa Brava, it was different and definitely worth doing once - particularly for the fresh water - but having swum in a few lakes outside Spain this year, it might feel a little too contained for someone looking for the joys of real wild swimming. 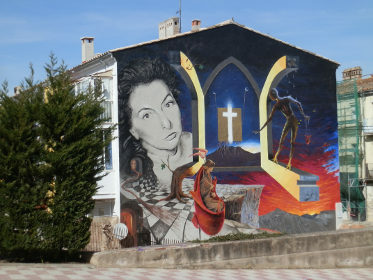 The Festival of Saint John (Festa de Sant Joan) is one of the major festivals of Catalonia celebrating not just the religious day, but also marking the start of summer and the end of school, as well as being close to the Summer Solstice. It is also one of the noisiest and loudest festivals because it's traditional celebrated by letting off bangers - and the louder the better. Many people head to the beach for all nighters to drink, to set off fireworks, and to wait for the sun to come up. For us, it's too noisy. Stalls selling fireworks open up for about a week before the night and slowly, during the build up to the day itself, we get more and more bangs. Until the day and night itself, where the bangs continue through the night. We used to live in Barcelona, and it was a night that was impossible to sleep. 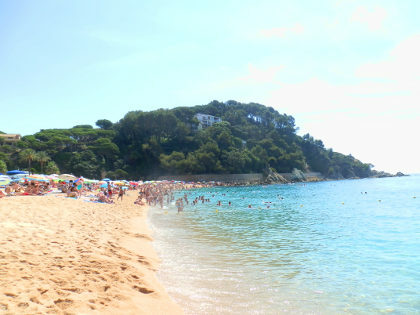 Now being on the Costa Brava, things are quieter comparatively - partly because the economic crisis reduced sales, but also because fireworks are banned from wooded area for the risk of fire. However, there is still enough noise to scare our dog, and so we tend to take a short break into France to get away from the bangs. Most of which is just noise, and not the colourful flash and sparkles of prettier fireworks. 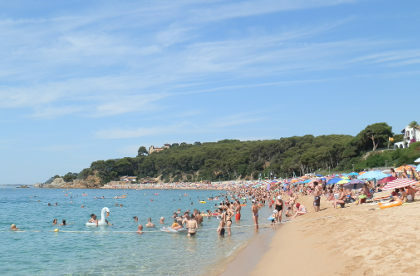 For the Costa Brava, Festa de Sant Joan is also the start of the Festa Major for Palamos (Sant Joan being the saint of Palamos). Festa Majors happen up and down the coast through the summer. Though they sometimes look as if they are tourist promotions, actually they are very much local affairs for local inhabitants with long historical traditions usually including a procession of Giants or Cap Grossa (big heads) that represent the town. During the day things are quieter, but often with events for children, or something cultural or sporting on. This year Palamos is commemorating the 475th anniversary of the 1543 attack and sacking of Palamos by the Ottoman Admiral/Pirate Barbarossa and his fleet of 20 galleys. 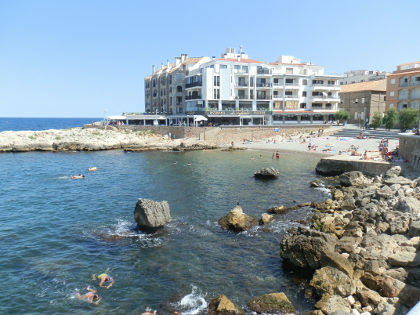 The main events start in the evenings and are known as 'barraques' with music from local Catalan bands and partying into the night with neighbours and friends, usually starting quite late - about 11pm and running into the night. Palamos's festival ends with a major firework display on the main beach running up to midnight. This time proper fireworks that light up the sky and are visible from a wide area.